Tenrod Australia supplied and commissioned an electronic billboard for Yamanto Tavern, designed to broadcast promotional messages for their business. Located at Warwick Road, Yamanto (near Brisbane), Yamanto Tavern recently had a P16 (16mm pitch) large video LED screen installed on their roof to broadcast promotions of their restaurant and pub as well as their bottle shop retail complex. Featuring a display area of 3m x 2.3m in full colour, the video capable full colour LED screen displays multiple messages to a large audience at the Yamanto shopping centre, conveying information about the products and wares available at the tavern and its retail outlets. 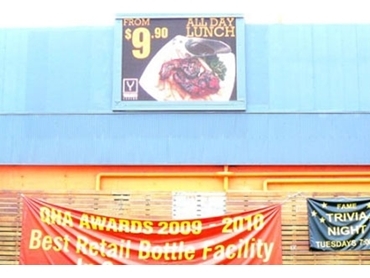 Yamanto Tavern can now display instant updates and vivid photo shots on the electronic billboard, eliminating the need to constantly print and hang up banners, and also avoid wasteful disposal of used messages. Tenrod’s LED screens can be used by venue owners to produce and upload the display content from the computer at the venue.